Welcome to ChurchSuite's Giving module! This module is designed to help churches manage the donations they receive and the givers who gave them. The Giving module also includes support for Gift Aid reclaims (UK churches) and Tax Deductible donations (North American churches). This article is designed to provide your finance team with a broad overview of the Giving module's functionality and highlight key features that may be useful to them in their role and to your church. We recommend you begin your use of the Giving module by reviewing the module's settings. Click on the cog wheels in the top right corner of the Giving module and check all the settings on each of the Module, My ChurchSuite and Donate tabs. Remember to save your changes before navigating away from the module settings. On the Module tab, in addition to in-built Donation Methods, add any additional custom donation "methods" by which your church receives donations. The, when recording donations, you'll be able to select the appropriate method that the donation was given by. For more information about custom donation methods, see the related support article at the end of this article. You can optionally set whether new Givers are assigned to a particular Tag, perhaps for the purposes of easily identifying and following up with new Givers. Tags are a great way to create custom groupings of givers within the Giving module - especially for communication purposes where you may wish to direct your messages to particular groupings (tags) of givers. For more information about tags, see the related support article at the end of this article. 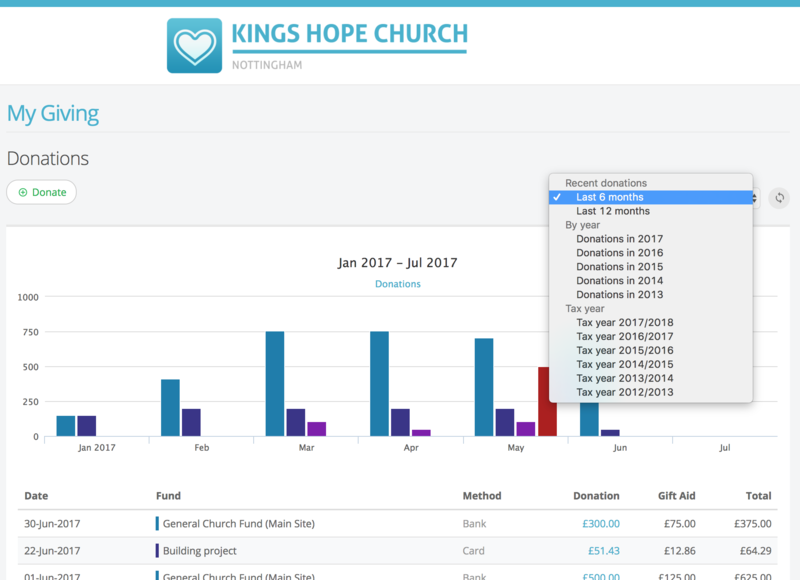 If your church produces annual Statements of Donations, add any optional custom message that will added to the statement - the message will be shown on emailed and printed statements. For more information about producing giving statements, see the related support article at the end of this article. For UK churches only, you can enter your church's HMRC Gift Aid Online information. Entering the information here will save you having to enter the details each time you submit a Gift Aid claim online. Be careful to enter exactly the right information in the correct fields. Do not confuse the Charity ID (issued by HMRC) and the Registered Charity Number (issued by the Charities Commission for your Regulator). The User ID and Password are those issued by HMRC, not your ChurchSuite user login details - and the Charities Online password is the one you use when you registered for an HMRC online account. For more information about reclaiming Gift Aid using ChurchSuite, see the related support article at the end of this article. For more information about the My ChurchSuite settings tab and the Donate settings tab, see the related support articles at the end of this article. You can optionally secure your Giving module with a module password. This prevents Administrator users, who ordinarily have full access to all modules, from being able to access the Giving module unless they know the module password. In this way you can restrict access to the module to just your finance team if you wish. To activate the module password, see the instructions provided in the related support article at the end of this article, or click here. When recording donations in the Giving module, they're assigned against a Fund, so there must be at least one active fund in your Giving module. Typically this might be a "general tithes and offerings" fund, but equally you can create multiple funds for other purposes - you might have different funds to distinguish donations made for particular missions or projects or special offerings. Churches can also use different funds to distinguish restricted, unrestricted and designated donations, so that they are able to best comply with the wishes of the giver when the donation is given. You can order your funds so that your most frequently used fund(s) are at the top of the list and therefore suggested by default when adding new donations. You can also choose which funds are to be visible in ChurchSuite's online giving Donate platform, so that potential givers can select between your available funds as appropriate when making a donation. In this way, funds can also be excluded from online giving if you wish. A great feature in ChurchSuite is that each fund has its own public-facing Fund page that can optionally be distributed as a page link in your church's communications or embedded in your website - ideal for when you want to invite givers to support a particular cause or project (fund) in your church. By using a fund page link, Donate can be locked down to just that one fund, making it really easy for prospective givers to make one-off and recurring donations that are correctly processed back against the fund in your Giving module, without having to select from a list of funds. Givers can even Gift Aid their donations (UK churches only) and ChurchSuite will store an electronically-signed, HMRC-approved Gift Aid declaration for the donation(s). Churches commonly receive donations by a wide variety of methods - cash, cheque, standing order, and envelopes. 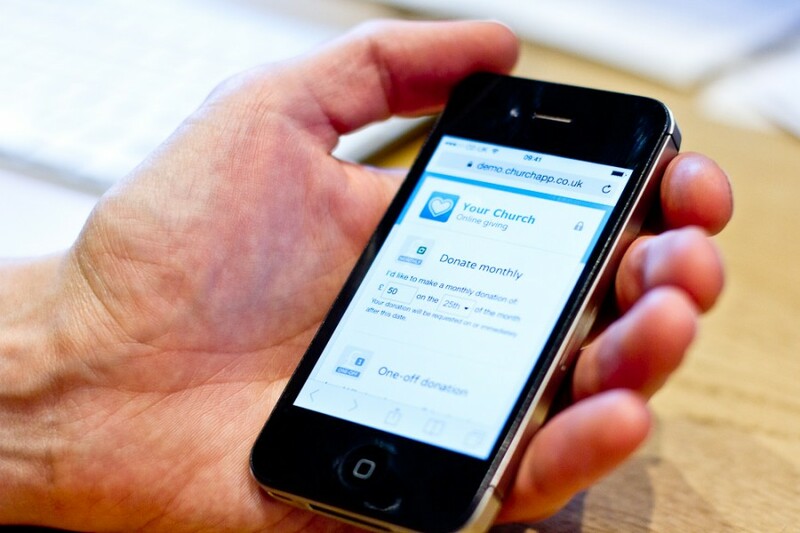 A large number of churches have a seen a growing trend in the use of online giving. While not intended to necessarily be a replacement for existing giving methods, online giving is growing rapidly as more and more givers find that they can begin the discipline of giving and stewardship in a much more accessible way. ChurchSuite includes an inbuilt online giving platform called Donate. 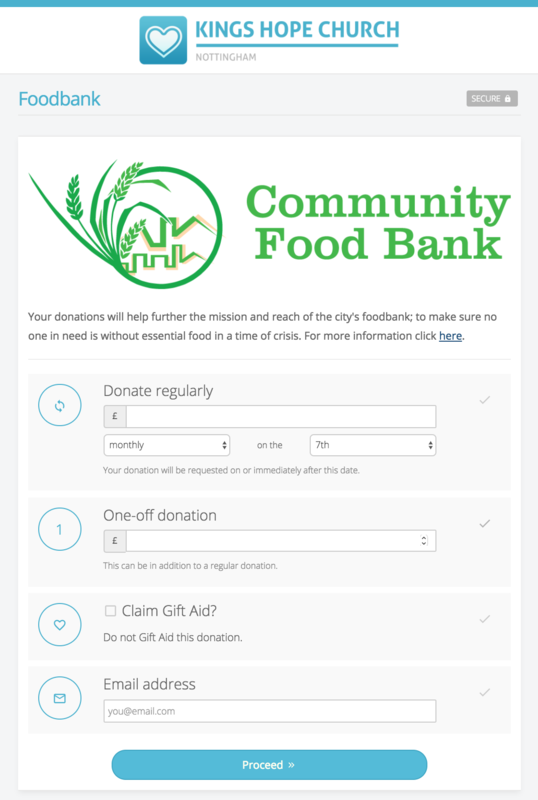 With very little configuration, churches can easily begin receiving online donations. There is a cost to online giving - a transaction fee is deducted from the donation at the point of giving, with the net donation being deposited direct in to your church's bank account. You can receive both one-off and recurring donations via online giving. Givers can easily make one-off or recurring donations, optionally select from your available funds, and for UK churches, Gift Aid their donations, with Gift Aid claimed on the gross donation, even though the church receives a "net of fees" amount. We integrate with two online financial merchants - Stripe* for card donations (also used by ChurchSuite for handling your online event ticket sales and booking charge payments), and GoCardless* for direct debit donations. Donations are passed directly from the giver's card provider or bank account in to your church's designated bank account. Both merchants process one-off and recurring donations and have been selected because of their excellent reputation for efficiency and security, and also for their competitive low fees. Many churches who use online giving find that the transaction fees are more than offset by the savings in administration and cash handling, and in the overall increase in giving that many churches experience by providing an online giving option. Online donations are recorded into your Giving module automatically; and either matched to an existing giver's profile (based on the giver's email address), or a new profile is created. 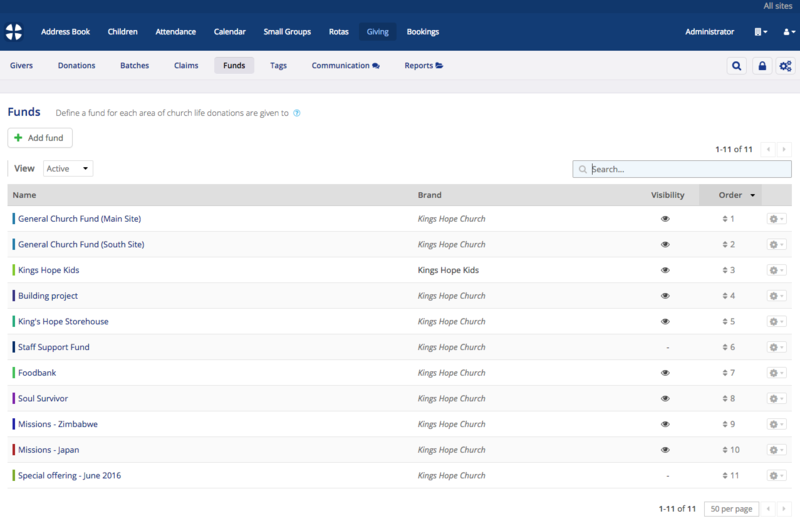 ChurchSuite also includes reports to help finance teams reconcile gross donations and fees. For more information about receiving online donations, see the related support article at the end of this article or click here. Once you've set up the Giving module for receiving online donations, you can also optionally receive donations using the in-built SMS giving functionality. Using your church's existing SMS text integration (e.g. Textlocal, Bulk SMS, Twilio), givers can text a donation to your church's unique SMS number (provided free by the SMS service provider) and they'll receive back a link to your online giving Donate platform, with all their donation details pre-filled. Each SMS giving text received will use one text provider credit (used when the Donate link is texted back to the giver's mobile device). Stripe or GoCardless transaction fees will also apply to donations made by card or direct debit when the subsequent donation is processed. Like online giving, SMS giving is intended to provide another accessible way for prospective givers to be able to participate in giving to your church, meaning givers can respond in the moment, even if they don't have their wallet or purse on them. Note that ChurchSuite's SMS giving workflows do not charge donations against the giver's mobile phone bill - instead the SMS giving workflow directs the giver through to Donate, where funds, giving method, amount, frequency, date and Gift Aid details can be specified. For more information about setting up SMS giving for your church, see the related support article at the end of this article, or click here. Within the Giving module, each giver will have their own giver profile. 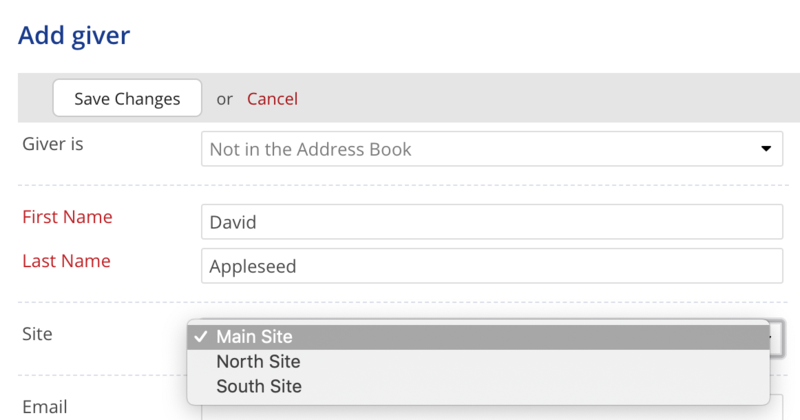 For givers that also exist as contacts in your church Address Book, the giver profile can be linked to the underlying Address Book contact; meaning that changes made to a contact's details are automatically reflected on the linked giver's profile too. For givers that are not part of your church, and therefore not in your Address Book (e.g. visitors), unlinked giver profiles can also be created - unlinked givers can easily be added to the Address Book later, if you wish. Duplicate givers are highlighted within the platform (and there's a Duplicate givers report) and can easily be merged where they are confirmed as genuine duplicates (or ignored, if they are separate individuals). Ordinarily a giver profile represents an individual. However, where a giver's donations represent a couple (e.g. where one partner is not working and unable to give in their own name), the giver profile can be set as a Couple profile. Then, either the linked giver's spouse/partner is also linked automatically, or an unlinked giver's spouse/partner name can be manually added. For UK churches only, the Gift Aid split between the couple givers can also be specified. Statements of Donations for couple givers are addresses to both partners. For churches transitioning from other finance software, you can easily import your givers into the Giving module from a CSV format file. ChurchSuite also supports multi-site organisations. In the Giving module givers can be assigned to a site and their donations reported on by the giver's site if you wish. UK multi-site churches will also produce site-specific Gift Aid claims - possibly with a Small Donations Scheme claim for each site (subject to HMRC site/region rules). Within a Giver's profile you can view their donation history, upload and manage Gift Aid declarations (UK churches only) and record and manage pledges. You can easily add notes against a giver too - ideal for jotting down important information. Churches can further categorise and group givers within their Giving module using Tags - either using Fixed Tags, to create custom groupings of givers; or with Smart Tags, to identify givers who match a defined list of conditions. 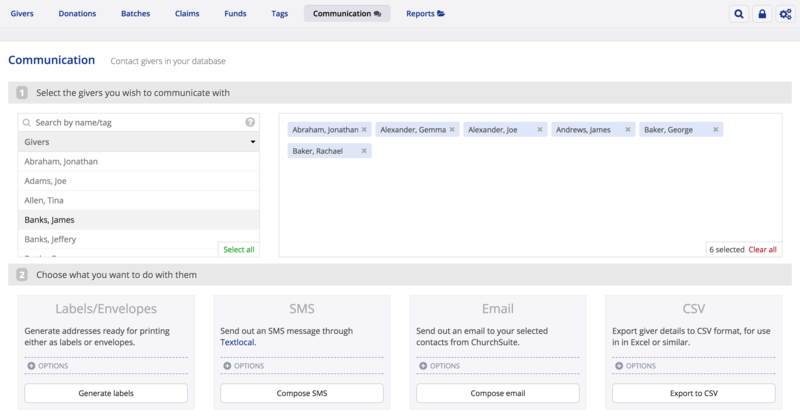 Communication is central to ChurchSuite's functionality, and that extends to the communications functionality in the Giving module. From giver profile pages, tags, reports and the module's communication utility page, communicating with just the right individuals or groups of givers is really easy. You can produce labels, envelopes, send an email or SMS, or export giver details to a CSV format file. adding donations within the giver's profile and on the Donations page > Add donation. adding anonymous donations under the Gift Aid Small Donations Scheme (UK churches only) to the GASDS giver profile, which will automatically manage Gift Aid reclaims up to the annual threshold. adding batches of donations - ideal for entering the weekly collection. importing donations from a file e.g. from a downloaded bank statement, or third-party application. For UK churches, each donation's Gift Aid status is correctly set based on the underlying Gift Aid declaration(s). For North American churches, each donation's tax deductible status is correctly set based on the fund the donation is assign to. In both cases, you also have the option to override the default Gift Aid/tax deductible status of a donation. When importing donations, perhaps from a bank statement, you'll assign donations to their appropriate giver. ChurchSuite will remember the imported bank statement giver references so that, for future imports, the correct giver will be auto-suggested as part of the import process. Multiple bank references can be recorded for each giver, catering for those givers who might give through different bank accounts for different purposes. Like all the other modules, the Giving module includes a suite of helpful reports for finance team and treasurers. The list of available reports is divided in to sections relating to Donate, Data Cleansing, Declarations (UK only), Donations and Givers and Pledges. 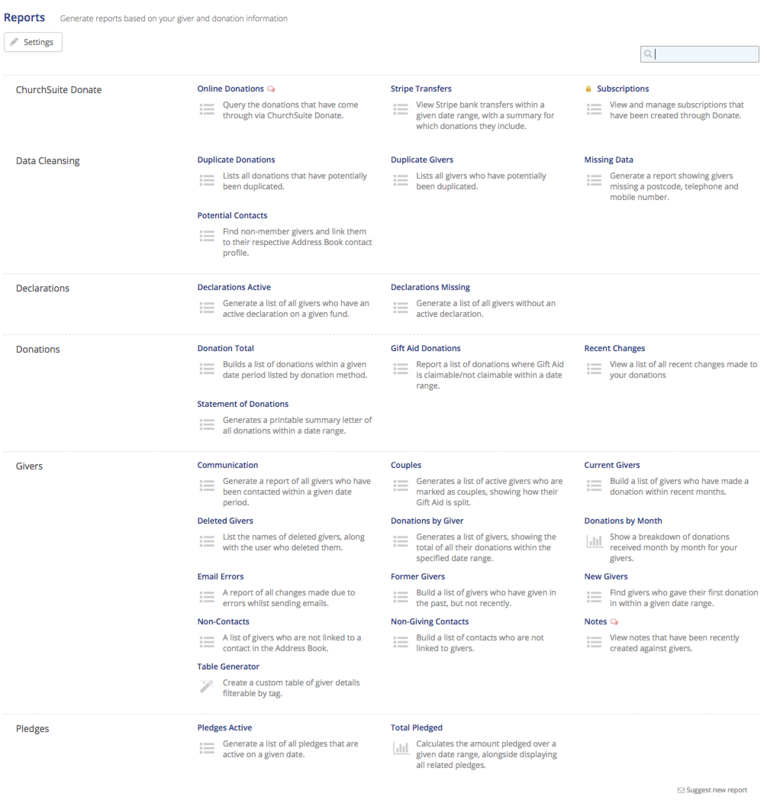 Each report has a range of contextual filters and printing/export options. You can also easily assign a tag or communicate to the givers matched by the report's results. For example, the following Recent Changes report shows a list of all changes made to your donations, including details of the change that was made, by whom and when, helpfully providing an audit trail of user activity within the module. 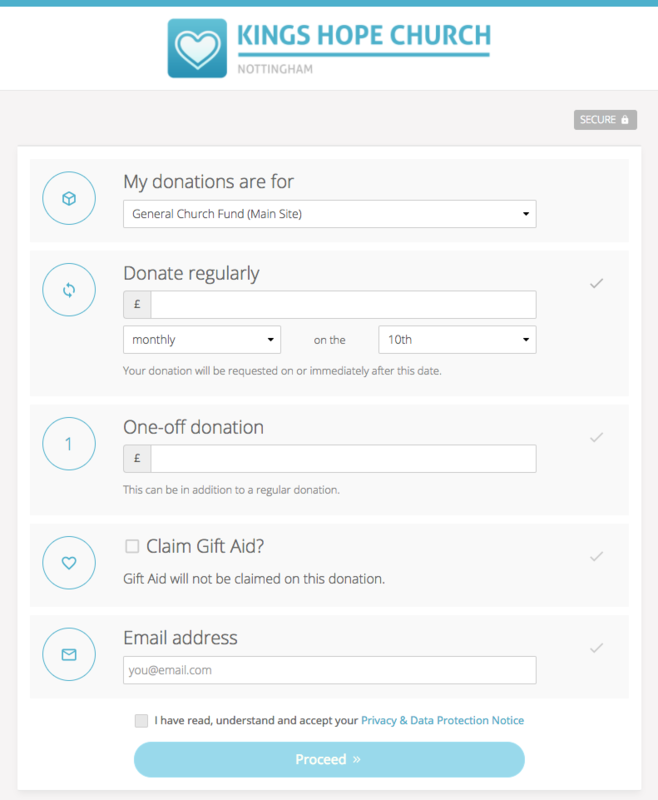 As mentioned in the previous section, ChurchSuite maintains an up to date Gift Aid status against all donations in the Giving module - not claimable, unclaimed, claimed, override, overclaimed, overclaimed and refunded - which is dependent on the presence of a valid Gift Aid declaration. You can even process Gift Aid overclaims and refunds where there are changes in a giver's Gift Aid circumstances, or where a user error has been made on a claimed donations and the mistake needs to be corrected and/or refunded to HMRC. 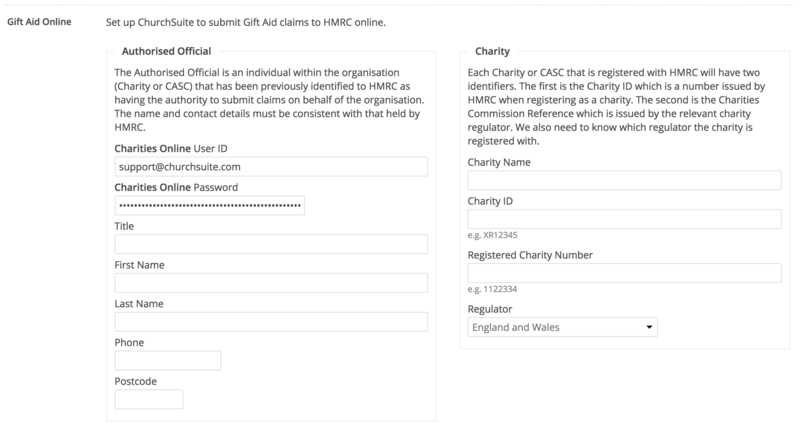 You can easily run a Gift Aid claim in the Giving module and even submit the claim online to HMRC. An intuitive claim process takes the user through each stage of creating a new claim, reviewing and completing the claim (including highlighting common issues, such as missing addresses required for Gift Aid), and then to either download the claim file for manual submission, or to upload automatically using HMRC online. The donation status of claimed donations is automatically updated as part of the process. The Giving module includes comprehensive reporting around Gift Aid, to enable your finance team to filter reports of claimable or non-claimable donations, or perhaps those that have been claimed, unclaimed or overclaimed. ChurchSuite enables you to easily produce statements of donations that can be printed or emailed direct to each giver, thus saving postage costs. Module settings allow churches to add custom content into the body of the statement, perhaps a note of thanks for people's support, or that all-important "Tax Exemption" notice that North American churches have to include in their statements to comply with filing requirements. In addition to providing printed or emailed statements, your givers can also view a full history of their donations in the My Giving section within My ChurchSuite.